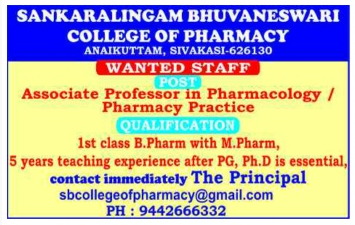 Sankaralingam Bhuvaneswari College of Pharmacy, Sivakasi has advertised in Dinamalar newspaper for the recruitment of Associate Professor jobs vacancies. Interested and eligible job aspirants are requested to apply by earliest. Check out further more details below. About College: Establish SB College of Pharmacy as a seat of high learning with excellence in professionalism. Establish an accredited centre of Post-Graduate education and research Seek International Collaboration in both academic activities as well as research, based on achievable targets of our institute. How to Apply: Interested Candidates may contact immediately.